James started kindergarten this week and is loving every minute of it! Rhys goes back to preschool next week, and this school year has been a huge transition for all of us. The boys, who are usually as thick as thieves, are separated for the first time and no longer have the same daily activities. Rhys is having a bit of a hard time with the adjustment, and we’re spending lots of quality time together this week before he returns to school. 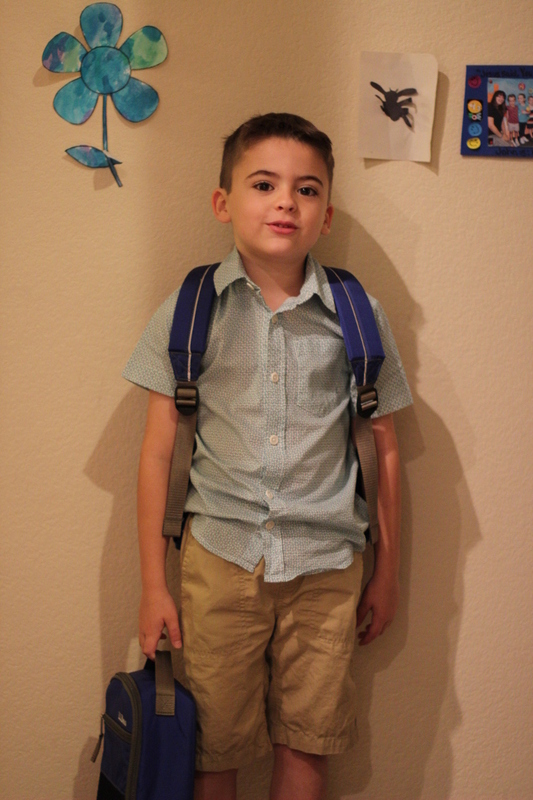 We definitely got used to starting preschool at 9 A.M., and now that James is in a public elementary school, things start much, much earlier. My alarm goes off at 5 A.M., which was my normal wakeup time for many years as a student and then as a teacher. But once the boys were born, I got used to sleeping later, since our mornings were slow and relaxed. I’m adjusting to this switch, too, and I’m feeling extremely tired this week. James’ new school is wonderful, but the last time I entered a public school was as a teacher. Now, I’m experiencing it again as a parent, and it’s definitely eye-opening. We are learning to follow the school’s rules for things like morning drop-off and afternoon pick-up, as well as navigating the traffic that goes along with it. I’m a nervous driver by nature, so I’m still trying to find the best parking spot and the path of least resistance that works for me. The good news is that the boys will spend their elementary years here, so I’ll have plenty of time to adapt and find a rhythm. I thought I was the only parent who found the start of a new school year stressful, but, as it turns out, I’m in the majority. Ryan found this post on going back to school, and while it’s filled with satire, it’s also incredibly true. I recognized so much of myself in that description, and I thought it was hilarious. If you’re a teacher, student, or parent heading back to school soon, I wish you a wonderful year! Aw, I’m sorry the transition has been a little stressful, but I hope he loves his new school and is making friends! He seriously is such a cutie! I secretely wanted to just squeeze them both up in hugs when I got to meet them, but I keep my cool (somehow : ). Boy that sure is an early start of the day, hope you all have gotten in the swings a bit by now & it’s less stressful. Aww, thank you. He loves school and we’ve adjusted really well to the new schedule.